GARY Caldwell has been hit with a fresh double injury blow on the eve of the new League One campaign. Both Tim Chow and Don Cowie will be sidelined for the big kick-off as Latics aim to bounce back from the disappointment of relegation from the Championship. Chow is waiting to discover the extent of the ankle problem picked up during pre-season. The 21-year-old was a notable absentee at the weekend as Latics concluded their preparations for the new campaign with a 3-0 defeat at Blackburn. Cowie, meanwhile, will definitely be out for several weeks after having his appendix removed over the weekend. The 32-year-old had already seen his pre-season wrecked by a niggling calf problem, before an untimely bout of appendicitis knocked him back even further. “Don’s had appendicitis and had an operation to have his appendix removed,” revealed Caldwell. “That’ll rule him out for a few weeks, and his calf is still causing him problems so he’ll be long term. “It’s disappointing for him because he’s a great lad who works hard and gives everything for the team. Emyr Huws is also not expected back until later this month after an ankle injury, although there is better news regarding centre-back Jason Pearce, whose recovery from a leg problem is coming along well. “Jason will hopefully be training with the squad at some point this week,” added Caldwell. The Latics chief was speaking after watching his side go down to their second defeat of pre-season at Ewood in a match that was closer than the scoreline would suggest. 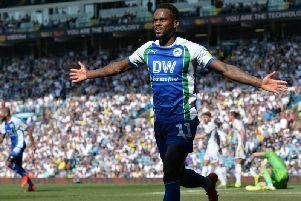 Latics gave as good as they got for the first hour, before running out of steam in the final stages as Willem Tomlinson, Grant Hanley and Ben Marshall found the net for Rovers. “I was disappointed to lose again but I was very happy with a lot of things in the game,” recognised the Latics boss. “And I’m sure when we look back on it there’ll be a lot of positives to take from it. “Without a doubt 3-0 flattered Blackburn, and I think they would admit to that. “But as I said to the players after, we’re playing for points next week and we can’t allow that to happen again. The Scot felt Latics paid a high price for failing to make the most of their early dominance. “That was another key aspect of the game,” he acknowledged. “At half-time I said to them that the only thing I could fault was the final pass, the final cross. “We should have been at least 1-0 up, probably more than that, the way we controlled the game. “But that’s one thing we have to work on this week - when we’re on top, we have to score goals to punish the opposition. “I’m really with the application and the work ethic the boys have shown in pre-season, and the fitness levels. “Obviously you would like to win games, and losing the last couple has been disappointing.